Looking for a good book for your Pagan child? I came across a childrens’ book today and, after flipping through it, I couldn’t pass it up for my growing collection of young Pagan literature. Any parents/educators should be familiar with the hugely successful “Magic Tree House” books. I see second and third graders reading them all the time. 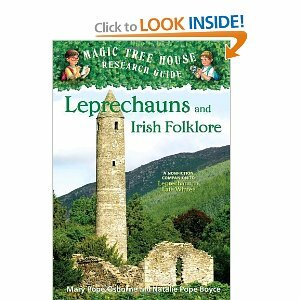 This book, entitled Leprechauns and Irish Folklore, by Mary Pope Osborne and Natalie Pope Boyce, is “a nonfiction companion to” a fictional book they wrote called Leprechaun in Late Winter. I read all 109 pages of the companion in an hour or so. What’s so impressive about this book is how open-minded and scholarly it is. While the authors don’t discuss the evolution of Lugh to leprechaun, they do briefly discuss the Tuatha De Danann. There’s a whole chapter devoted to the modern history of Irish folklore. It features sections about Douglas Hyde and Lady Gregory, for example, and even introduces the subject of British occupation. Different spirits are discussed, such as the trooping fairies, pookas, and clurichauns. The authors give examples of how people have/can befriend the good folk, as well as how to defend against them. All the examples are consistent with the lore and folklore studies I’ve been reading. The selkies have a section too but are called merrows (or múir ógh for sea maiden). Speaking of Gaelic, the Irish is pretty accurate as far as I can tell with my novice understanding. Children reading will learn about the filí and raths for instance. I love that the authors used actual Irish! My only real complaint is that the Druids are presented only as “wise men” (73) rather than men and women. The book sometimes relies too heavily on the more modern idea of diminutive winged fairies but makes up for it by explaining that they can appear however they want. Otherwise I highly recommend it for Pagan parents, especially those with Irish hearth cultures. It’s very well written, contains beautiful illustrations and photographs, and even includes a section with further reading and research tips for youngsters to follow! Rather than calling a belief in fairies nonsensical, the book leaves it up to the reader to decide for him or herself what to believe. I really appreciated that bit of spiritual tolerance / allowance for magic. Very cool, and I have seen these books around, they're cute. I'm glad you're expanding your library of young literature. I would still love to create a book with you. I plan to read even more this summer than last. It's so relaxing. I should build you a bookshelf specific to your Irish studies…. Oooh! That would make me one very happy gal! Yeah I'd still love to work on a book as well. We'll have to get together and collaborate.